At Naughty Dog, we strive to make you, the player, feel as though you inhabit the stories, characters, and worlds we create. If we’re doing our job right, every aspect should feel believable and grounded in our fiction and we should elicit the same response in you as the characters are experiencing in the game. The key to it all is in details. Whether it’s animation, lighting, performance capture, dialog, or environment design, we spend a lot of time on even the smallest details that, when they all work together, help establish that emotional connection and sense of immersion. When we first learned about PS4 Pro, we were excited to see how we could drive new levels of fidelity and immersion in our games. We’re taking our first step by introducing day-one PS4 Pro support for Uncharted 4, The Last of Us Remastered, and The Last of Us: Left Behind. Whether you own a 4K HDR display, normal 4K display, or even just a 1080p display, you’ll be able to reap the benefits of PS4 Pro with our new game updates. Though, once you’ve seen them in 4K HDR, it might be hard to go back to anything else. It’s easy to think of resolution as simply a measure of clarity, but for games, it’s about more than just a sharp, clean image — it’s about a greater sense of depth and scale. PS4 Pro has allowed us to meaningfully increase the resolution so that you’ll not only appreciate more detail in the textures, but smoother, sharper edges that better distinguish characters, effects, and the environment. Terrain, buildings, and plant life that might otherwise blend together really stand out, creating life-like distance. It’s especially evident in the wide, sweeping landscapes of Uncharted 4, as well as the overgrown cities and towns of The Last of Us Remastered. Perhaps equally important, the higher resolution allows us to maintain that fidelity in motion, eliminating the shimmering that you might see on the standard PS4. For those with a 4K display, Uncharted 4’s story can be played on PS4 Pro at 1440p resolution, up from 1080p on PS4. Multiplayer’s fluid, high-framerate gameplay remains the same, but the resolution has also been increased to a full 1080p on PS4 Pro, up from 900p on PS4. The Last of Us Remastered, on the other hand, allows you to choose whether you want to play in the game’s original target framerate of 30 frames per second at 2160p or at a high targeted 60 frames per second at 1800p. 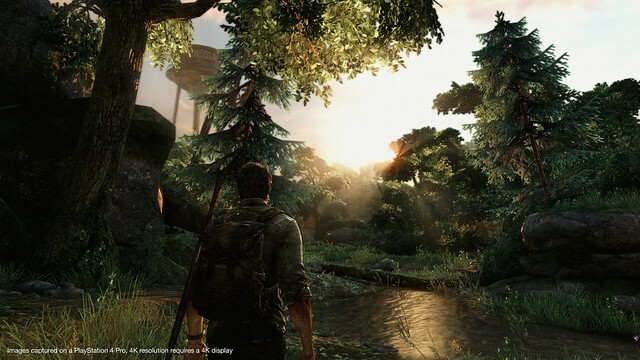 Combining enhanced resolution with an HDR-capable display will only make the benefits of PS4 Pro more apparent when playing Uncharted 4 and The Last of Us Remastered. HDR drastically expands the range of color and brightness in both games, particularly on the lightest and darkest ends of the spectrum. Uncharted 4 and The Last of Us Remastered use color in distinctive ways and each highlight the numerous benefits of HDR. 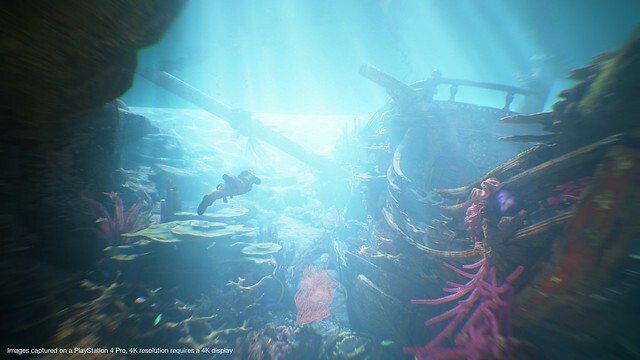 Whereas Uncharted 4’s exotic locales leverage a brighter, more painterly composition to highlight HDR’s full breadth of colors, nature’s reclamation of towns and cities in The Last of Us Remastered necessitates a more organic and gritty approach that complements HDR’s deeper, richer black tones. Best of all, HDR support is available on the standard PS4, as well as PS4 Pro. The Uncharted 4 and The Last of Us Remastered communities have already been able to produce some awe-inspiring images with our built-in Photo Mode tools on PS4. Now, with the PS4 Pro, we expect to see even more stellar creations as players will be able to capture 4K screenshots using the system’s Share functionality. You can also use the Share button on PS4 Pro to stream at up to 1080p at 60 frames per second, or capture in-game highlights at 1080p at 30 frames per second. We hope you’ll share your Photo Mode shots and best gameplay moments with us using our submission tool on naughtydog.com/ugc! We are really proud of the experiences we’ve been able to create for PS4 and now bring to PS4 Pro. We believe that the addition of HDR and 4K technology not only adds a new level of depth, detail, and life to our games, but opens new doors for the future. We hope you enjoy Uncharted 4 and The Last of Us Remastered on PS4 Pro! *This post has been updated to reflect a change with regards to PS4 Pro’s benefits for The Last of Us Remastered running on standard 1080p displays. For more information on the update, visit this link. Hello. The Last Of Us on my PS4 Pro played at 60fps by default. I was asked at the main menu if I want to turn on HDR but that’s it. To play in 4K do I just set the 30fps option in the “Display” settings? My TV is 4K by the way. Indeed! The resolution will change accordingly. Scott lowe, I played uncharted 4 multiplayer and you were in the lobby :) not to put it out there but I think your psn was Gonzo_IGN It’s nice to see you guys playing uncharted 4. Alright I’ll check it tomorrow thanks a lot for the info. Do you see any difference in visuals? I’ve tried both modes and they look identical. I’m not happy. I will try UC4 today, but TLoU looks fantastic. This coming from a guy with a nice pc who plays at 1440/80+ fps. The colors are more vibrant, and the image is nice and clean. That’s on my 1440p monitor. I can only imagine how great it looks on a 4k HDR display. I don’t plan on getting the PS4 Pro, but if I were to ever get one, it would mostly be for these two games. You’re my favorite developer, Naughty Dog. Thanks for all the great experiences. It would be nice NG would fix the trophies in Uncharted 4. Peaceful Resolution is still broken, satisfied the requirements 3 times and still doesn’t unlock. Cant Wait i dont know how uncharted 4 can get better but This will probably make it better. Love you naughty dog! Will Uncharted: The Nathan Drake Collection be getting updated? I very like TLOU improvements, but disappointed with U4’s, because we wanted 60 fps in story mode, and I think PS4 Pro is capable to do that with a bit more optimisation. Is there a chance that Uncharted: The Nathan Drake Collection, would get the PS4 Pro treatment as well? This is something I’d also like to see. It doesn’t have to be 4K 60fps, but an enhanced 1080p/higher resolution HDR modes would be great on the Uncharted Collection. This is really exciting news! I already have the Platinum for Uncharted 4 but would play through this gem again to experience the upgraded graphics. Can’t wait to get my Pro! Thanks for all your hard work. Has there anything been done audio-wise? I still miss the days when Uncharted 1+2 had lossless sound, U3+U4 hadn’t. Hey Scott, I was wondering if you had any information on 21:9. I have a 3440x1440p display. And I was wondering if I’d be able to play at that res instead of having black bars. 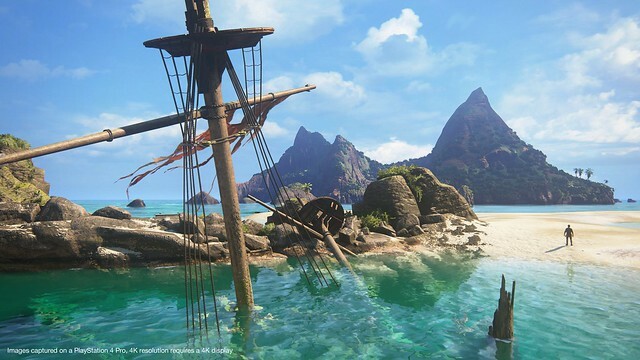 The resolution and framing would be determined by your display and the PS4 Pro, but our updates for Uncharted 4 and The Last of Us Remastered do not support native 21:9 output. Sorry! I agree that Uncharted 4: A Thief’s End is a fantastic game, but I don’t think 4K would make any major differences, but I respect your opinion. @ + KOTOR4240 whether you agree or not, 4K is the selling point of the PS4 Pro. Yes there are other advantages, but 4K resolution is the main marketing tool they’re pushing for this system. Therefore, it *is* disappointing that SONY’s flagship title does *not* reach 4K even upscaled. 1. In Uncharted 4, I only see the HDR on/off switch. No way to switch between 1080p/60 or 4k/30. Is that on purpose? Second, before I start the game it tells me my TV (= projector) only supports HDR at 2k. That’s not true. I am able to play video content at 4k in HDR, no problem. One would think that Sony’s high end 4k console would work well with Sony’s high end 4k projector – are these teams not liasing? Is there a chance you could escaate this to Sonys tech support or do I need to open a ticket? I’m not sure if this is an isssue with the Sony projector, the console or your implementation within the game. Advice? 2. In Last of US, I fiind it a bit unintuitive that a menu option called “Lock at 30 fps” means “4K”. That’s a stretch for the average customer – I consider myself a techy guy and I wouldn’t have expected the resolution setting to hide behind the FPS lock option. Why not call it “Enable 4k”. The framerate is the effect on gameplay; an option shouldn’t be called that (I am involved in software UI design, so it would actually be interesting to understand that choice!). Furthermore, on the option screen it’s extremely hard to see the effects on graphics: When I switch from 30 (4k) to unlocked (1080p), I see no differences in image quality, aside from the shadows on the curtain. Why not use a clear before/after effect? It’s the USP of the PS4 Pro, so demonstrating it in the options menu could be beneficial. Uncharted 4 doesn’t run at 60 fps. It’s 30 no matter what. That’s why there’s no option to switch. According to a Forbes article apparently Sony electronics (the TV division) and Sony games (PS4 guys) don’t work well together, which also explains why no UHD BD in PS4 Pro. I have to say their group CEO is just a moron. I am also usin a PS4 pro an Sony projector but also getting essay 2k HDR only? I am running it through anthem amp. Do I need to change any settings? Well, I checked the TV settings and all I can do is turning on HDR Video picture mode there, but that’s it. In Deus Ex the difference between TV set to HDR and the internal game settings set to HDR is quite huge. The former looks too unreal and crazy. I might have to adjust the HDR settings to look similar to the automatic 2K HDR settings of Deus Ex, not sure. I would have loved to get a more detailed explanation than simply “check the TV settings”. Maybe more like “check the TV’s HDR settings” or even “turn the TV picture mode to HDR and adjust” or something. Something that tells me I am on the right track. Check your TV settings. I have a Sony 850c. Turns out Hdr wasn’t turned on. For me, I had to go to Settings..External Outputs.. Hdmi signal format..and then change the Hdmi port to enhanced. THAT turns Hdr on. Good luck! Will the ps4 pro version run with better effects in 1080p? I’m pretty sure that you can play The Last of Us Remastered on PS4, PS4 Slim, or PS4 Pro, so what’s the point of “remastering” the same game a second time? That doesn’t make any logical sense. Gameplay videos are showing that the last of us is actually running WORSE than it did before on the standard PS4. It is dropping from 60 fps far more consistently. Do you have anything to say about that? Is there going to be a patch in the future that will fix this or at least allow a 1080p option to decrease the load on the system bit more and hit 60 as much as it did previously? I too can CONFIRM that tlou is running consistently worse on pro than PS4. I played the intro sequence on the pro first and then the standard PS4 and the difference is night and day. The pro drops frames regularly and for extended periods of time while the base PS4 stays mostly locked to 60. Jumping around the game via my save files the frame rate is severely compromised in all areas of the game. Does anyone with a PlayStation Tv or a Vita notice any difference in the quality of Remote Play with the PS4 Pro? Concerning these two games. Directly connected, through the same router, over the internet. ps4 pro is amazing< titanfall2 look so amazing on the pro HDR , 60fp on my LG 55inch 4k tv . best thing about this i dont lag at all when i turn HDR on , especially playing multiplayer . #sony u get a 10/10 for this one . Any chance of an unlocked U4 framerate at 1080p? I think the HDR mode on both games needs a patch. Both look far too faded in color and the skin tones to far too pale. It’s not my tv settings either as Infamous and Ratchet both look great. This is unacceptable… Please give us a 1440p or 1080p mode to lock the framerate to 60 fps. It’s not “pro” when the performance is worse than on the regular ps4. I’m not a techical expert but one could assume that the game could have those high resolution shadow maps with a locked 60 fps if the resolution was lowered to 1080p or 1440p. It would nice to have an option like that. Btw, I think that the last of us is one of the greatest games ever made! After reading the above article, I’m still confuse. If I used PS4 pro to play uncharted 4 or the last of us remastered on 1080p TV with HDMI 1.4, will the ps4 pro force to render at 1080p resolution ? If you are using a 1080p display. it’s supposed to do what’s called super sampling. it renders at a higher resolution then downscales it. This basically creates a sharper crisper image that’s still at 1080p. Look up SSAA. This is what the article here says anyways. My question for Naughty Dog. One thing about Last of Us prior to pro. If you used 30fps cap before pro, it enabled improved shadows. My question here is. Are these improved shadows now enabled by default on the pro at 1080p/60 setting? Or they only used by the 30fps cap which is also the 4k setting now apparently? Thanks MysticalOS for clarifying. It’s interesting to me that both uncharted 4 and the last of us does not show me any 4K mode in the games (using PS4 pro) when I played with 1080p tv HDMI 1.4. It doesn’t tell me if I play the game in 1080p or in Super sampling image. Uncharted 4 sure looks good on PS4 Pro, but the noise of the Pro’s fans are so loud that I just can’t play it without headphones. I don’t know why, in other games fans are quiet. The game renders at 1800p/60fps with low resolution shadow maps on the pro. I’d say it’s kind of a wasted opportunity to push all the additional gpu power towards higher resolution especially when the game runs slower on the pro than it did on the original. (check the link from my first comment). No amount of super sampling on a 1080p screen will justify the performance cost. The frame rate dips are pretty disappointing. Naughty dog should have went for 1440p to achieve a more stable framerate. Hopefully there will be a patch in the future that fixes it up. Turning on HDR mode on UC4 & TLOU makes the colors worse. Thr colors look far more muted like the color has been drained. Ratchet & Clank & Infamous in HDR Look amazing so no issues with my TV, So why are ppl saying HDR looks great on TLOU & UC4 when it clearly the colors look worse ??? any news on firmware update ps4 pro HDCP??????? Really cool update. your games are fantastic to play and dive into. Looking forward to your future projects!! Uncharted 4 in 1440p is a nice bonus but The last of US in native 4k is fantastic. Most people are saying FPS is king but I will always go for better graphic and higher resolution everytime. You guys need to patch the Nathan Drake Collection with native 4k ASAP and tell Sony to do the same with their God of War games.